Originally titled Tonight, NBC’s late-night talk show was a counterpart to the Today show, which aired early morning. Originating in 1953, Steve Allen was the first host of this experimental show which became quite a success. 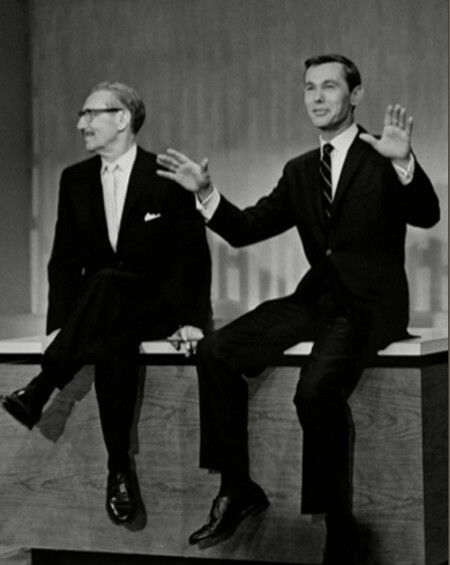 Allen left the show in 1957, and Jack Paar took over. It was Johnny Carson’s success on Who Do You Trust? that led NBC execs to invite him to replace Paar. At first Carson declined because he thought interviewing celebrities for 105 minutes (the show’s run time back then) would prove to be too difficult. NBC approached several other personalities, including Bob Newhart, Jackie Gleason, Groucho Marx and Joey Bishop. All declined. In March 1962 Carson ultimately accepted the job, but first had to complete the last six months of his ABC contract. During this time NBC used “filler” guest hosts. Carson took over The Tonight Show on October 1, 1962, despite his continual fears that it wouldn’t be successful. Ed McMahon, whom had worked as the announcer on Who Do You Trust? joined Carson as announcer and sidekick. The first Carson episode featured guests Joan Crawford, Tony Bennett, Mel Brooks, Groucho Marx, Ed Metzger, and Rudy Vallee. 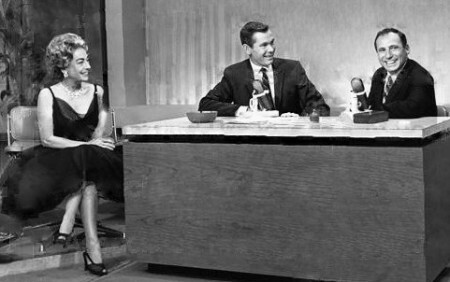 Joan Crawford was a guest on Johnny’s first night as The Tonight Show host. Despite Carson’s fears, the show became very successful and was renamed to The Tonight Show Starring Johnny Carson. A true celebrity himself, everyone wanted to be on his show. Many considered making Carson laugh then being invited to the guest chair was a high honor. Carson is credited with launching careers of scores of performers, including David Letterman, Jerry Seinfeld, Tim Allen, Drew Carey, Ellen DeGeneres and Jeff Foxworthy. Carson was great with product endorsements, too. In 1966 he played the new game Twister with Eva Gabor. After the broadcast of that show, sales skyrocketed. In 1973 he joked about an alleged shortage of toilet paper. Almost immediately people began bulk-buying and hoarding the tissue, thus causing an actual shortage for several weeks. Carson hosted the late-night show for nearly 30 years. He stepped down on May 22, 1992 to tremendous media coverage. For many viewers, the show lost its best thing when Carson left. This is most likely because a man in total fear wound up just being himself, and ultimately won over the hearts – and laughter – of America.